Have YOU Tried to Get Others Converted — Saved? HAVE YOU tried to induce others to read The PLAIN TRUTH, TOMORROW'S WORLD or, listen to The WORLD TOMORROW broadcast? Perhaps your wife — your husband — one of your family — a close relative, or friend? But if you haven't — DON'T!!! I know that many of our readers — yes, thousands of you, out of our more than five million readers of these magazines — have been led to accept God's TRUTH. You have learned to LOVE your Creator's TRUTH which He reveals — and which we MAKE PLAIN. The TRUTH becomes the most precious thing in your life. You become excited about it. You are filled with enthusiastic ZEAL over it. Before, like all unconverted people, you were carnal-minded — SELF-centered, selfish. But now, your mind is GOD-centered. NOV, instead of exclusive SELF-concern you have an enthusiastic OUTGOING concern for others. Especially those in your own family — your relatives — your closest friends. You want to SHARE this wonderful TRUTH. You want them to inherit eternal life in the Kingdom of God. You want to save them from perishing. Your MOTIVES are well intended. Your ZEAL is splendid — but you may be like a woman I knew who had more zeal than wisdom. This woman tried by her TALK to "save" her husband and her teen-age son. But instead of arguing them into it, she turned them to hostility, resentment, embitterment against God ! This woman tried to save her neighbors — almost her whole town. She only turned them all against her. Oh yes! But did you notice HOW He said we must let our light shine? LISTEN: "Ye are the light of the world... Let your light so shine before men, that they may SEE your GOOD WORKS..." (Matthew 5:14, 16). NOTICETH AT CAREFULLY! He did NOT say "that they may HEAR your good ARGUMENTS." He said that they may SEE your GOOD WORKS! Should you never tell anyone about The WORLD TOMORROW or, let anyone see The PLAIN TRUTH? YES, by all means — but be CAREFUL HOW you do it. To just MENTION the broadcast to a friend, and SUGGEST that he or she might find it interesting is fine. I wish you would. BUT, don't go too far! Don't URGE, ARGUE, or try to TEACH religion. NEVER PREACH to unconverted people. We don't on The WORLD TOMORROW and in The PLAINT RUTH. We want to reach the unconverted on The WORLD TOMORROW, as well as the converted. Did you ever notice that The WORLD TOMORROW is not at all like the RELIGIOUS broadcasts on the air? It NEVER starts out with religious hymns, and a voice in a sentimental syrupy tone saying, "Dear friends in Radioland, I trust that this broadcast will bring a blessing to your hearts — isn't it WONDERFUL to know the Lord?" Do you know what happens when such religious broadcasts start on a radio station? Well, MOST people tuned in snap the dial quickly. They either tune to a different program, or they turn it off. Only the "religious audience" — an infinitesimally small part of the whole radio audience — remains. And they probably tune in specially because they are regular listeners to that particular program. But do you know WHY millions upon millions of people buy and read such magazines as Reader's Digest, Life, Look, McCalls, Ladies' Home Journal, etc., etc.! These magazines are filled with articles about PEOPLE — about their everyday PROBLEMS — about WORLD CONDITIONS — HUMAN-INTEREST subjects. The MILLIONS are interested in THOSE things. EVERYBODY is interested in such questions. But only a very small FEW by comparison are interested in a sentimental, emotional RELIGIOUS broadcast that sounds just like a church service. On The WORLD TOMORROW and in The PLAIN TRUTH we do not drive people away by "PREACHING AT" them. We want ALL people to hear the Good News. So we TALK ABOUT THE THINGS ALL PEOPLE WANT TO HEAR! We talk about the VERY questions, problems, conditions, and subjects that cause multiple millions to buy and read these other magazines, and the news magazines. But we make these interest-gripping subjects far more interesting by injecting life and spark and meaning into them by use of Biblical material that ASTONISHES — in a nonreligious-sounding manner — giving the surprising, eye-opening, practical and authoritative ANSWERS to the many increasingly disturbing questions, problems, and happenings of OUR DAY. In this way, we open people's eyes to the real ANSWERS to the otherwise UNanswerable problems that plague governments, science, and people generally. People are ASTONISHED to learn that such answers are in the Bible. They are being told by educators that "there are no answers. There are NO SOLUTIONS." Then they hear the ANSWERS on The WORLD TOMORROW answers that MAKE SENSE. It SURPRISES people to learn that the Bible is UP-TO-DATE, dealing with TODAY'S conditions, news, problems. Then there's a lot in HOW it is done. It is done in the professional MANNER of a Network news analyst, or a Network documentary — not in a religious-sounding manner. THAT'S THE REASON The WORLD TOMORROW has either the BIGGEST audience or the second biggest audience on most radio stations. So, if you want to induce MORE and MORE people to listen to The WORLD TOMORROW, don't tell them it is a "religious" broadcast, because it is NOT like any religious broadcast. Tell them it is an exciting NEWS, HUMAN-INTEREST, EDUCATIONAL program that is MORE TALKED ABOUT than any on the air. But if you mention religion or the Bible, chances are they won't even start to listen. The PLAIN TRUTH follows the same pattern. It's not like any church or religious paper or magazine. 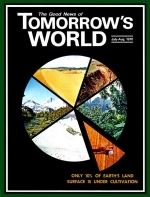 It's a WORLD-NEW magazine. It's a magazine about PEOPLE — their problems and interests. It's a human experience magazine. You might do many of your friends a great service by letting them see your copy of The PLAIN TRUTH. Don't URGE them to read it. Don't ARGUE them into it or try to talk them into reading it. If it doesn't grab their interest, FORGET IT! If it does, tell them they may have a year's subscription, already paid — NO COST to THEM — and show them on the inside front cover the mailing address, so they may write in for it. But remember, THEY must request it for themselves. We try to let our light shine by our GOOD ACTIONS, here at God's Headquarters at Ambassador College. We do the same at all three campuses — in Texas and in England. And we are gaining the respect of our communities. I learned this lesson about letting people see your good deeds rather than your good ARGUMENTS many years ago. This was explained in the 18th installment of the Autobiography, published in the June 1959 issue of The PLAIN TRUTH. Hundreds of times in the past year, people who have begun to "preach" and run into trouble have written us, and we have had to send a reproduction of this part of that 18th installment to these people. When I heard that, I decided to reprint my own experience of many years ago (over forty), in this column. Don't You Make This Mistake! This year 1927 was a very eventful year in my life. As soon as I swallowed my bitterest pill of rebellion, surrendered to obey the Mighty God through faith in Jesus Christ, this new Christian WAY became the most happy, joyful experience of my life. Studying the Bible became a passion, I plunged into it with a fierce zeal. The all-day sessions at the Portland Public Library did not stop with my capitulation to the truth following the six months' anger-inspired study to end my wife's "fanaticism." No longer was it an intensive study driven by anger and determination to have my own way. Now it was an enthusiastic study of eager anticipation literally thrilling to every new discovery of spiritual "light" and Biblical truth. I did succeed, apparently, in talking one sister-in-law into a certain start. I had to learn later it was a false start. She was baptized, either when I was, or very shortly afterward. But, as too often happens when a high-pressure salesman talks one into something he doesn't really want, she turned against it all shortly afterward. I had to learn, however, that, even though I had believed I was a pretty good salesman in my earlier business experience, I was unable utterly to "cram my religion down my relatives' throats." My efforts only aroused hostility. They said I was "crazy." It nearly broke up our marriage — even though Mrs. Armstrong did NOT attempt to inject her new religious belief into me. In our case the marriage was saved only because I accepted the challenge to study into it myself, confident I could prove she was wrong. But most mates will not study into it, Most unconverted mates, especially if the converted one tries to talk the other into his or her religion, will break up the home. In the more than thirty-two years since my conversion, I have known of dozens and scores of marriages that have ended in divorce because the newly converted mate tried to talk the unconverted one into accepting it. In a very few, if any, instances has the unconverted mate been talked into accepting it. Of all things evil and harmful a newly converted Christian can do, the very WORST is to try to talk your husband or wife into your religion. WHATEVER else you do, let me plead with every such reader, NEVER commit this tragic sin. If you love your husband or wife, don't do it!! If you love your Saviour who died for you and now lives for you, DON'T DO IT!! Remember these scriptures: "No man can come to me," said Jesus, "except the Father which hath sent me draw him" (John 6:44, 65). Again, Jesus said: "Think not that I am come to send peace on earth: I came not to send peace, but a sword. For I am come to set a man at variance against his father, and the daughter against her mother... and a man's foes shall be they of his own household.... He that loveth father or mother (or wife or husband) more than me is not worthy of me... And he that taketh not his cross, and followeth after me, is not worthy of me" (Matt. 10:34-38). God made every human a free moral agent. Thank God! — no one has power to force on you any unwanted religion. But if such difference already exists, do not make matters worse by talking religion to your mate. Do all your taking to God in prayer. Let your mate see your happy, pleasant, cheerful, joyful, loving WAY of life — not hear your arguments or nagging! Allow your mate complete religious latitude and freedom — whether to be converted, religious, irreligious, or atheistic ! I am glad I learned that lesson early. I have had to maintain certain business connections with many people, since being plunged into God's Work. I must maintain contacts with radio men, publishers professional men. I get along splendidly with them. A big reason is that I never talk religion to them. I never try to talk anyone into accepting Bible truth or being converted. I go to the world over the air, and in print, and everyone is free to listen, or read — or to dial out or not read. No one gets our literature unless he personally requests it. We try never to force God's precious truth on anyone. That's GOD'S WAY! Do you know how the Apostle Paul won individuals to Christ? Not the way people attempt to do it today. He said "I am made all things to all men, that I might by all means save some" (I Cor. 9:22). When he talked to an unconverted Jew, do you suppose he spoke as a Christian, thinking he is "witnessing for Christ"? Do you suppose Paul said to the unconverted Jew: "Have you received Christ as your personal Saviour? Oh, won't you just kneel with me right here, dear brother, and give your heart to the Lord right now?" Or, do you suppose he said: "Look here, my Jewish sinner-friend, you're on the way to hell. Your religion is all wrong. Every day you reject Christ as your Saviour you are crucifying Him afresh. You are worse than a thief or a murderer. I'm going to keep after you, and pester you with my arguments, and drum them into your stubborn ears, and beat them into that stiff rebellious mind of yours until I force you to become a Christian." No, that is not the way Paul spoke to unconverted Jews. Paul said: "Unto the Jews I became as a Jew" (I Cor. 9:20, 22). Paul spoke to others from their point of view! He talked to a Jew just like another Jew — from the Jewish viewpoint — showing sympathy and understanding of the Jew' way of looking at Christianity. They were — and mostly are today — hostile to the idea of Jesus being the promised Messiah. Paul did not rouse hostility — he put it down. He got on the inside, so to speak, just as one of them, so that they were sympathetic toward him, not hostile. He became as a Jew, "that I might gain the Jews." Even so he gained only a small minority, yet it was a large number. Perhaps you have had your eyes opened to the fact that sin is the transgression of God's Law. Most professing Christians have been taught, and consequently sincerely believe, that "the Law is done away." Paul was inspired to write that the carnal mind is hostile to God and to God's Law; "it is not subject to the Law of God, neither indeed can be" (Rom. 8:7). If you say to your unconverted mate who is hostile to God's Law, "You're just a rebellious sinner, and your church is just one of these false worldly churches. You've got to repent, and obey God's Commandments if you are going to be saved" — you have not only aroused hostility, you have yourself been hostile, and you probably have broken up your marriage. How did Paul talk to such people? Listen: "And unto the Jews I became as a Jew, that I might gain the Jews... To the weak became I as weak, that I might gain the weak: I am made all things to all men, that I might by all means save some" (I Cor. 9:20-22). If you believe God's truth, and your husband or wife does not, NEVER TALK RELIGION to him or her. If your mate normally thinks and speaks only of material and worldly things, then you must speak of material things to your spouse. If The WORLD TOMORROW broadcast has, probably because of your own aggressiveness in trying to get your mate to listen, become a sore spot, go off to some private room to hear the program. Keep the volume turned down. Make every effort NOT to antagonize your husband or wife. And again, when you talk about it, talk to God in prayer. Let your mate see your good works, in a manner that he or she will naturally approve. Avoid every hostility. Be pleasant. Keep cheerful! Be happy! Radiate JOY!! Give LOVE and warm affection!!! Do everything to cause your husband or wife to like you! THAT IS THE CHRISTIAN WAY! !